Celebrate New Year’s Eve Canmore style … outdoors! Great family event including ice skating, warming up around a bonfire with hot chocolate and hot dogs while you enjoy the fireworks. 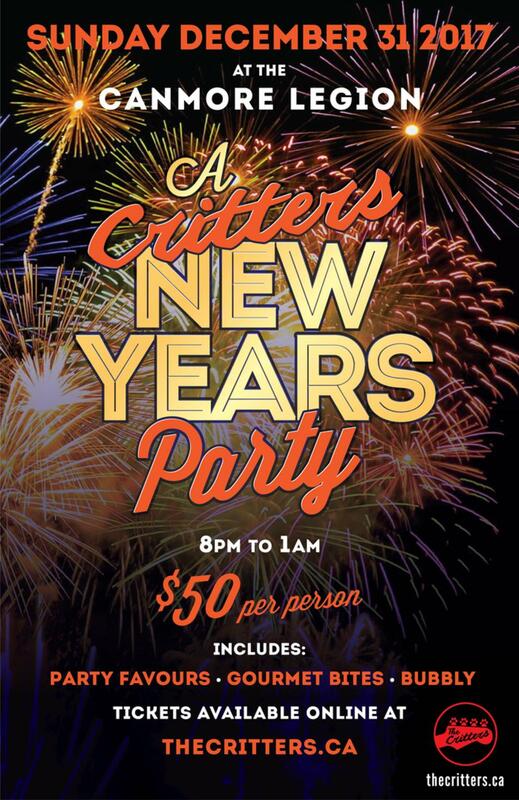 Enjoy an evening of food and Champagne, party with a DJ while you ring in the new year. The Canmore Legion is hosting The Critters for a night of live music, gourmet bites, champagne and party favours. Book your table for New Years Eve at Gaucho. They will be serving all the usual favorites, plus some more mouth watering additions to the menu. Electric Squirrels will be performing popular covers and door fee includes party favours and a sandwich buffet at midnight. Tickets can be bought at the Rose & Crown or by phone.